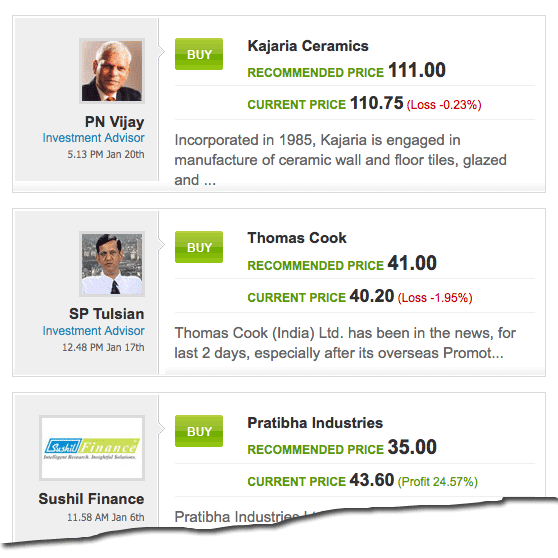 PowerYourTrade is one of the most known stock tips website among Indian investors because it is very heavily promoted on moneycontrol.com. My honest review about their service would certainly mean my account can have some trouble but I think my readers deserve to know the truth and that is more important to me than my account status in PowerYourTrade. I opted for yearly option for combo offer of PWT (PowerYourTrade) just to make sure I am not judging their service on a very small time frame. On 26th Jan 2012, my account status is as follows. I am a member of PWT for last 90 days now and it is quite a long time for me share my review about their service. So let me share some of the key facts about the service. When you are not a paid member in PWT you are mainly driven into being a member by the following recommendations. 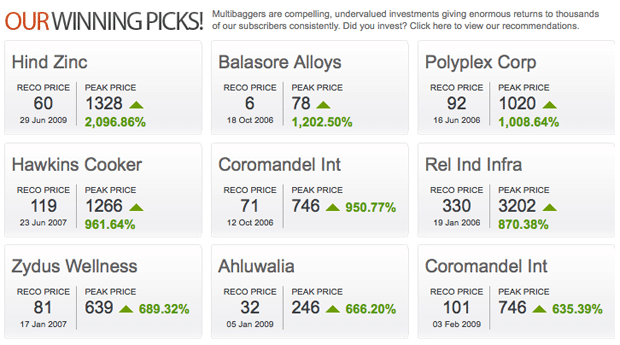 You see multibaggers that have gained few hundred percentages over a period of few years. Not only that if you see previous multibaggers here, you see everything green. On Jan 26th 2012 I see it as follows. The obvious question that you may have – Is the first screenshot wrong? No it is not wrong. You may have not noticed one thing that makes first image correct, which is the date of recommendations by experts. If you note the recommendation date you will see that those gains are for stocks recommend in June 2011 and beyond and nothing after that. It means very few Multibaggers have done anything substantial in the current market scenario. Many can argue that that having dates means they have the accurate information but that is also not the case all the time. 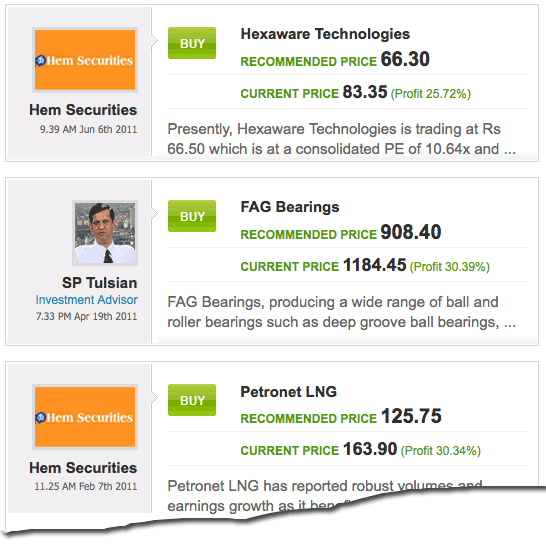 On April 19th 2011 SP Tulsian initiated a buy call on FAG Bearings, which is up by 30% now. The reality is on April 29th 2011 SP Tulsian initiated a sell call on the same stock and so even if you purchased the stock on his call you would have sold it anyway and it means the recommendation is not at all a reality where you make 30% but as guest you only see that a recommendation is up by 30%. See the screenshot below for sell call for the same stock after 10 days on 29th April 2011. This actually reveals the secret to gains of 2000% as well. They recommended the stock at some point and that stock is now up by 2000% but that does not mean they have not initiated any sell call in between and you can actually make 2000% in reality. There may be buy and sell call but they only show the calls they have taken some time back that has gained few hundred percentage. You can view 10 pages of Multibaggers stocks recommended over time and as of today I see the following calls in Multibagger calls from 2009. Very few have performed from 2009 till date. 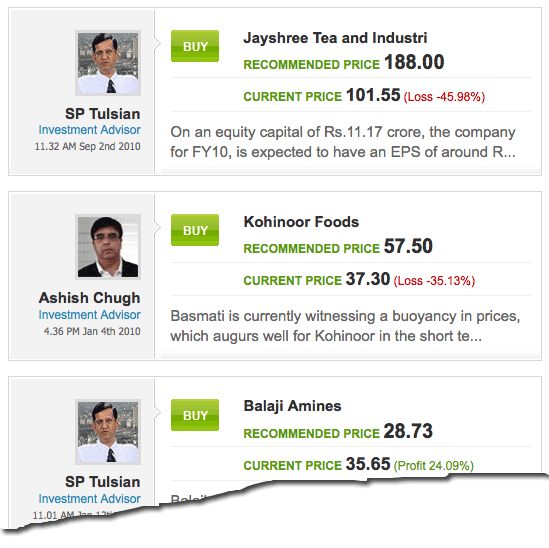 You can subscribe to PowerYourTrade tips if you understand that every multibagger stock suggestion is not a multibagger and they are just any other stock suggestion. Apart from that Hem Securities Multibagger calls are more reliable and works far better than any other calls. This is my personal experience based on some tracking that I did for last 3 months. Update: I don’t share any stock tips and so please do not email me for any stock ideas. I am a personal blogger who let you understand how to trade and invest in market but don’t prefer sharing what stocks you should be trading in market.